DIY Investing Resource #3: The Intelligent Asset Allocator - Can I Retire Yet? The following post was originally published on Eat the Financial Elephant in March 2015, shortly after my wife and I dug out from under our past investing mistakes. It is the third of the four most valuable resources that helped us go from feeling clueless to competent managing our investment portfolio. Bernstein is a neurosurgeon, author of 7 published books and several e-books, and founder of the money management firm Efficient Frontier Advisors. I just threw that all in there for any of you who think that you don’t have the time to learn to manage your own money. I previously featured JLCollin’s “Stock Series” and John Bogle’s “Little Book of Common Sense Investing” to introduce the concepts of low-cost, passive index investing. “The Intelligent Asset Allocator” builds on these concepts, explaining why you should consider adding small amounts of complexity to hold a more broadly diversified investment portfolio. This book is not an easy read as the first two resources were. I found the effort required to be fully worthwhile for the timeless lessons shared in the book. This review will focus on a few of those key concepts. The overall point of this book is to explain the concepts behind modern portfolio theory. “The Intelligent Asset Allocator” gives DIY investors the knowledge and tools to build a diversified portfolio. The goal is to not have the optimal asset allocation, which is impossible to know in advance. The purpose of holding a diversified portfolio is to be able to expect to do well in a variety of different circumstances. Much more important than worrying about optimum allocation is choosing an allocation that you are comfortable with, understand, and which gives a good chance of success in many scenarios. This increases the chance you’ll stick with it. It is important to rebalance your portfolio regularly, once every 1-2 years, to stay at your target allocation. Data shows that adding a more risky asset class in small amounts can actually lower volatility of a portfolio while increasing returns. Likewise, adding a less volatile asset class with lower expected returns in small amounts can considerably decrease volatility of a portfolio with minimal loss of return. You must own international stocks to have enough different asset classes with adequate risk/reward ratios and low correlation. The greatest benefit of diversification is gained through holding just a few different asset classes. As you add more asset classes you start to get diminishing returns for the effort. The book does a great job of giving sample investment portfolios for both the investing junkie who can tolerate great complexity and the “simpleton” who wants little more complexity than that offered by traditional indexing and can be widely diversified with as few as three or four funds. My wife and I started investing shortly after starting our careers around 2001. We’ve experienced two of the biggest crashes in US market history (albeit with very little and then only a moderate amount of skin in the game) and one of the biggest and longest running bull markets. Throughout our investing lives, we have stayed our course. We felt we were comfortable with the cyclical nature of the market. However, we had little understanding of the longer term history of peaks, crashes, and the amounts of time it can take to recover in the US economy. Prior to reading this book, I had no idea there were full decades in history where US market underperformed international markets and even bonds. This book does a great job of giving long historical perspective to investing, allowing you to make fully educated decisions on your asset allocation. Reading this book, which some may consider dated over a decade after its original publication, made it more interesting in my eyes. It allowed me to see how the lessons in it continue to be true today. It was also interesting that Bernstein suggested investing in “low cost” index funds which he described as bond funds with expenses <.5%, stock funds with expenses <.7%, and international funds with expenses <1%. Our current all in expenses are about .1% for a widely diversified portfolio as suggested in this book. This shows the power of educated consumers who, through Vanguard and the competition it places on the market, have made it possible to virtually eliminate investment expenses. This was not possible just 10-15 years ago. Bernstein points out that there is an inherent risk/reward relationship in investing. Investors should be rewarded for taking on more risk. Historically this is mostly true. On a continuum, the least to most risky (volatile) assets are cash, bonds, large stocks and small stocks. Long-term returns are the exact opposite. The best performers are small stocks, then large, then bonds and then cash. However, this risk/reward relationship is not always present. Asset classes such as precious metals and long-term bonds historically have excessive risk for the return they are expected to provide. There are also occasions where an entire market is so overvalued that it can not be seen as a good investment. Bernstein points out that you would not walk into a grocery store and buy tomatoes without knowing if they were $1/pound or $10/pound. However, that is exactly how most people buy their investments and project their returns. In chapter 7, Bernstein outlines several simple ways to evaluate market valuations including Price/Earnings (P/E) ratios, Price/Book (P/B) ratios and dividend yield to determine whether investments are over or undervalued. Bernstein makes a compelling case to weight your portfolio towards value oriented funds, especially for small cap stocks. He also discusses how to value bonds. Bernstein emphasizes not altering your asset allocation as most people do driven by fear and greed based on public sentiment, political conditions, etc. However, he hints that there are times when it may be wise to alter your allocation to buy more “tomatoes” when they are especially cheap and sell some more when they are getting too expensive. Bernstein also explains how current valuations enable you to predict with more accuracy what expected returns will be in the future, rather than simply using past average returns. While this book does not provide enough information to make me feel that I am an expert on investment valuation, it has opened my eyes to an important area for further study. It also gave us confidence to make more accurate projections of our future investment returns than using historical averages. This will shape our retirement strategies, allowing us to decrease longevity risk associated with an early retirement. A traditional index fund investing approach focused on owning the US stock market through a single, low cost, tax efficient, widely diversified fund will do better than the vast majority of investors. Using modern portfolio theory allows you to build a more diversified portfolio with little additional cost or effort. This more broadly diversified portfolio should provide as good, or better, returns with less risk. 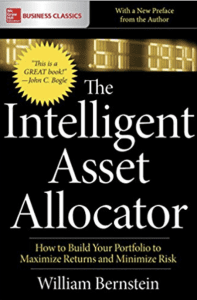 “The Intelligent Asset Allocator: How to Build Your Portfolio to Maximize Returns and Minimize Risk” is a great resource to show you how and why. May I suggest you examine https://sumgrowth.com for a thoughtful contrarian view of MPT. I’m pleased to read the review of this book and now having read your review, I plan to pick up a copy for my financial library. I’m a big fan of investing In negatively correlated assets which is why I have purchased physical bullion as well as I’ve invested in real estate crowdfunding. These asset classes definitely do not jive with equities. As Chris points out this book is not an easy read. As I recall the first 6 chapters were challenging to follow, with lots of graphs and mathematical equations. My suggestion is to read those chapters at a high level. The book has lots of great information and insights into investing. Definitely worth reading.